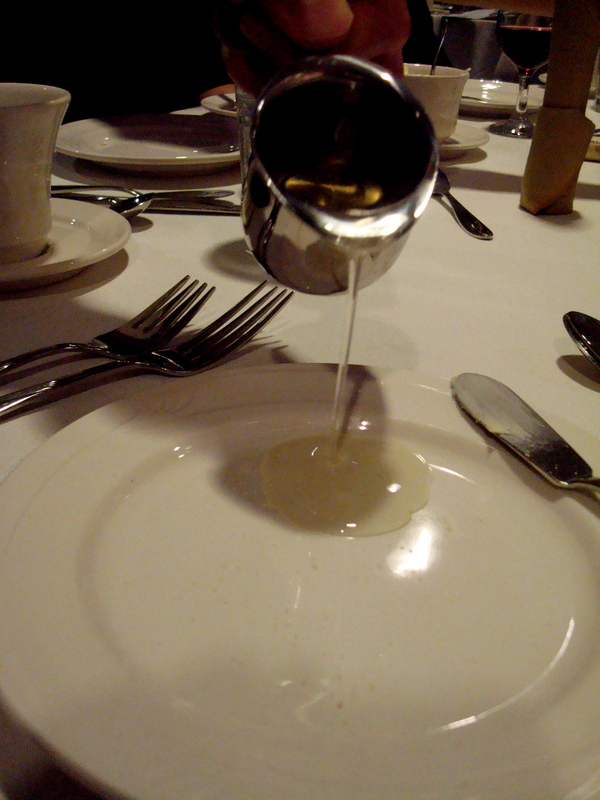 Chef Jack Czarnecki's famous white truffle oil: made with real wild Oregon ones, not the chemical lab-produced stuff. It’s comforting to experience and blog about events we’re having the fortune to experience for the second time in 2010, as we’re well into our second year here. Like with the recent Oregon Truffle Festival and tonight’s Fungal Feast, also in Eugene, which we again attended this year with our mycologist neighbors, Joyce and Dan. The meal (except for the appetizer) was even better this year. Feel free to compare with last year’s review. I was especially excited since the guest chef staging the feast with the Lane Community College culinary students was none other than mushroom specialist Jack Czarnecki, owner of the world-famous Joel Palmer House (where my parents graciously took us for my birthday last year). 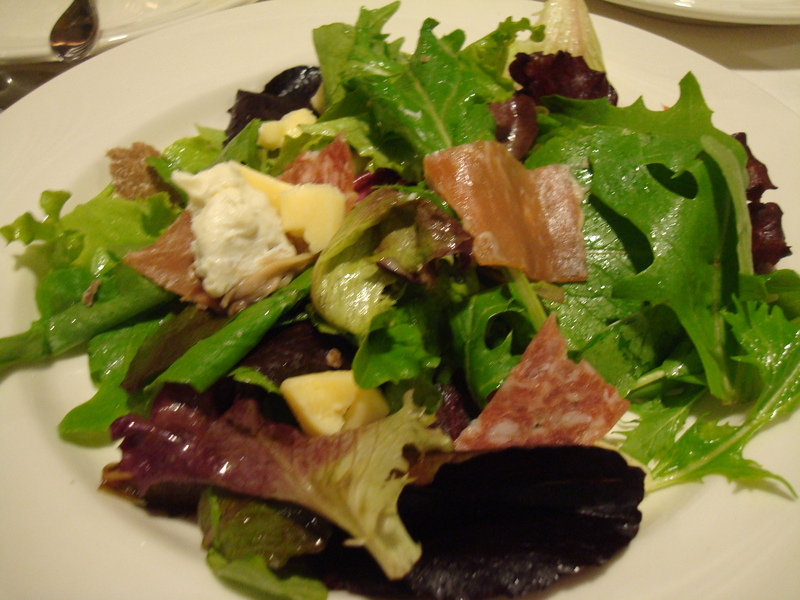 Followed by a truffle-infused cheese and salami salad. The meal began with rosemary ciabatta bread dipped in Czarnecki’s glorious white truffle oil, purportedly the only all-natural one manufactured with domestic truffles here in the U.S. Delicious as it was, we couldn’t bring ourselves to pay $30 to bring a small bottle of the oil home. I prefer to enjoy my truffles on rare special occasions. I wouldn’t want to get too used to these things, like the son of the Mycological mushroom distributor at our table who wrinkled his nose at truffles, complaining of “truffle breath” and the way they made him burp. That’s a burp that smells good to me. But when they’re past ripe, a rotting one, such as a rare Oregon Brown (Calapooia) truffle specimen I sniffed tonight, can smell putrid. The entree: roasted pork loin with dried morels, with winter chanterelle-studded wild rice and an unusual sauerkraut-split pea-porcini mushroom puree on the side. Buttermilk panna cotta with mapley candy cap mushroom syrup for dessert. Though last year’s black truffle and gnocchi appetizer was more memorable, it was incredible in the salad tonight how refrigerating the salami and cheese with truffles allows the oils in the fat of the meat and cheese to absorb the fungi’s pungent aroma over a period of weeks. That’s the same process folks use to infuse butter or even eggs (through the shell!) with a truffle’s essence. 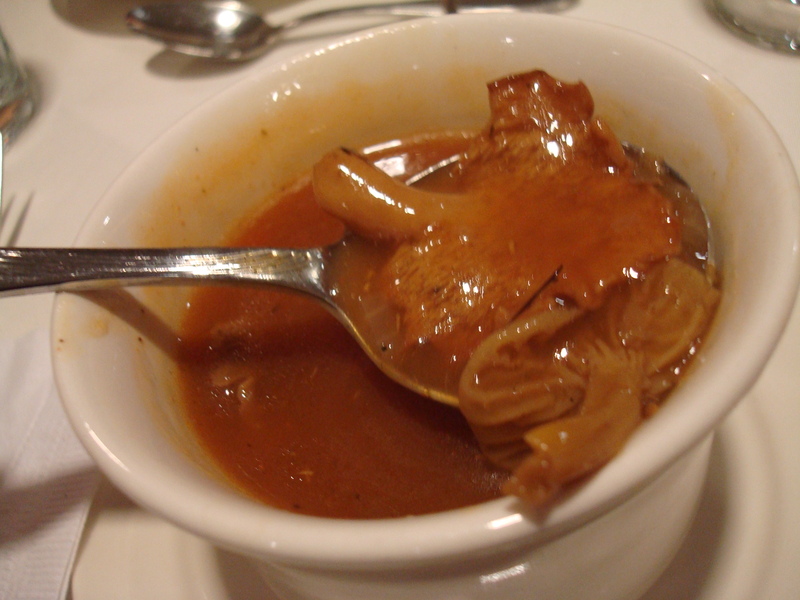 The entree was stellar; the Polish-influenced side dishes particularly unique. 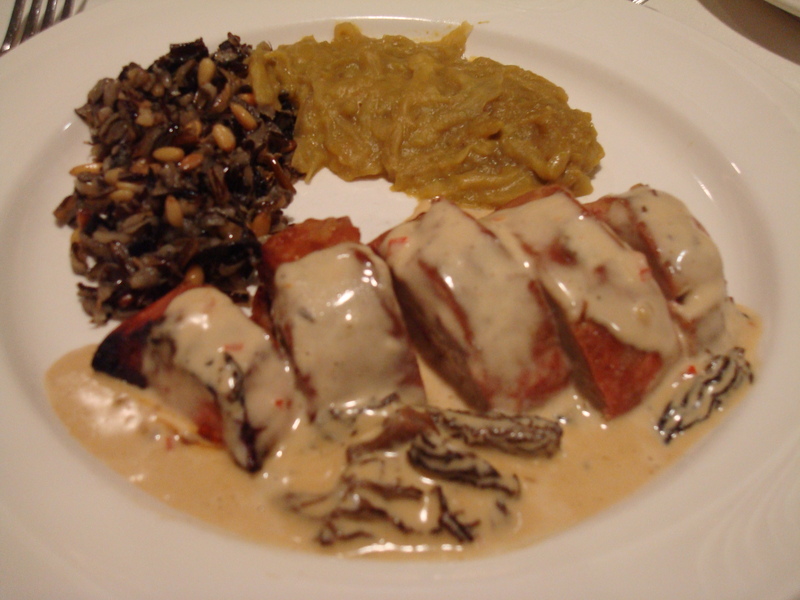 Dried morel mushrooms floated in a caraway-and-sweet pepper cream sauce bathing the perfectly-braised pork loin. Note to self: go foraging for morels when they appear in April. I fell in love with the creamy Polish kapusta, the humble sauerkraut and split peas dish Czarnecki gussied up with porcini mushrooms. The sweet peas temper the bracing brine of the kraut. I should make some with the jars of homemade kraut sitting in the fridge. This dish was sure new to me. 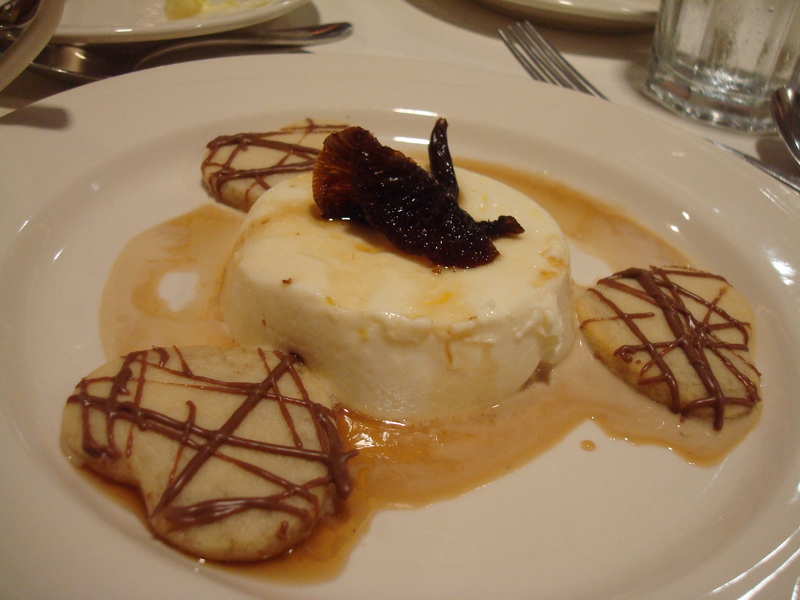 And for dessert: panna cotta (like creamy Jello) topped with a candy cap mushroom syrup. I bid on some of these surprisingly maple syrup-flavored dried mushrooms (only when dried is that sweet aroma revealed). Neighbor Dan said mycologists think candy caps contain the same chemical compounds used in artificial maple syrup. But I did have a winning bid–only $3– for a small bag of hedgehog mushrooms. They’ll make a nice sauce for Valentine’s Day steak.